What a gorgeous creation, I love the wonky shape of the panels! Julie's amazing creation just blew me away. Lucy's fab punched and woven stitching was really different. I loved Emma's hand stitched banner. WOW - we're one year old next week so this is our 'anniversary' challenge. We hope you'll join us to make it a memorable one!! To celebrate we're offering a surprise parcel to someone who plays along with us this week. You don't have to do anything other than join in with us. We hope you'll play along and celebrate our 1 year anniversary! who are offering a prize of 3 digis from their shop. your Favourite Recycled Item (& why). You MUST explain WHY it is your favourite item. My favourite item to recycle is ribbon. The piece I've used on this card was taken out of the shoulder of a purple top. You know those thin little straps they put inside the shoulders, supposedly to help them stay on a hanger, but all they seem to do is poke out the neckline so you spend all day poking them back inside! So I cut them out and recycle them of course! Although it's not come out too well in the photo, it's actually a lovely deep satin purple. My Favourite item to recycle is cereal boxes. It's great free Kraft card and you can colour it just the same as real kraft. I have also recycled a toilet roll tube to use as a stamp; this is a fun way of adding some grunge. 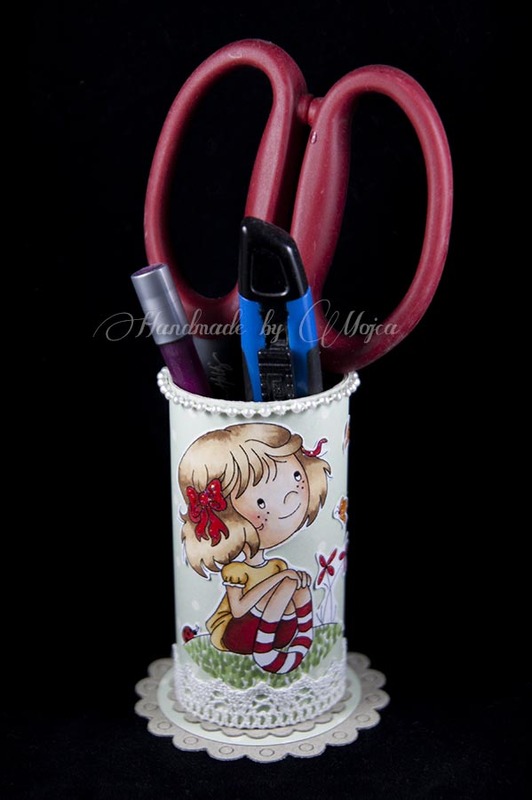 I really like to make these cute pots for tools from toilet paper rolls. After all we crafters need plenty of places to store our pens, pencils and so on!! I like altering chip board shapes. 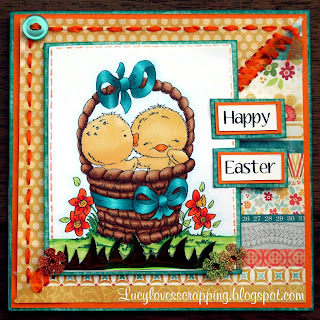 This is a door tag I covered with Maja papers. 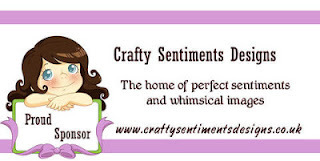 I used lace ribbons and the pretty image is from Crafty Sentiments, called Looking Up. showcase your Favourite Recycled Item (& why). Well done on the winners and Top 3 are awesome! Wonderful makes from the DT and some great recycling ideas! Thanks for sharing!